A new Ryerson-led campus in Brampton is a step closer to reality following a vote by city councillors Wednesday morning. Brampton has committed to invest $50 million over the course of 10 years towards the partnership between Ryerson and Sheridan College, along with $100 million for a joint-use community centre near the proposed campus in Brampton. Mayor of Brampton Linda Jeffrey, elected in 2014, pledged in her campaign to bring a university to Brampton. “We see it as a very positive announcement, first of all, that Ryerson wanted to be our partner, and for council to agree that we want to align ourselves [and] city-build with Ryerson and Sheridan College,” said Jeffrey. The Ryersonian previously reported about the possibility of a Ryerson campus extension to Brampton. The city is among the top 10 in the country by population but it still doesn’t have a university campus. Brampton city councillor Gurpreet Dhillon says this has been one of the biggest issues for decades. The new institution’s programming will be focused on STEAM (science, technology, engineering, arts and math), with an emphasis on advanced technology. The funding approval comes in addition to $180 million from the government of Ontario to be divided between new learning institutions in Brampton and Milton. Ryerson president Mohamed Lachemi spoke at the city council meeting but was unavailable for comment upon request. City council is expected to make a final decision on its support for the university later this year. That will take place after Ryerson and Sheridan complete a report for the provincial government and the government approves the plan. 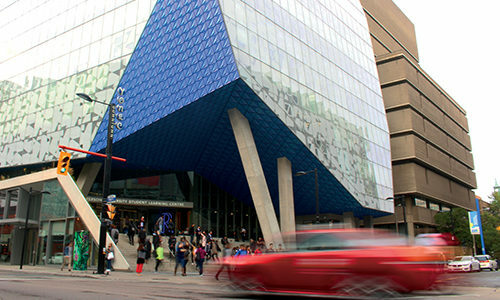 “Ryerson already has a great reputation, but this is going to grow it to a new level,” said Jeffrey. What’s next for the RSU?